Attention Mustang Enthusiasts! 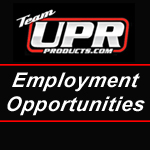 Do you want to work for UPR Products? If you are located in or near the Lake Worth, FL area, take a look at our current job openings listed below! Click on the job titles for more information.